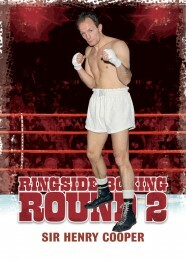 Good: Continuing where the first set left off, Ringside Boxing Round 2 fills a void in the hobby. 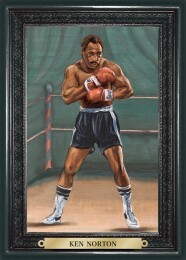 Rather than tossing in a few token cards in random sports sets, In the Game subsidiary Creative Cardboard Concepts goes all out, charting much of boxing's modern history. The limited print run and strong hits provide solid value, even when collectors don't get major stars. The memorabilia swatches are bigger than most and on-card autographs are always welcome. Bad: The checklist doesn't feel very expansive. Despite a 100-card base set, there's a lot of fighter repetition in many of the subsets. Also, there doesn't seem to be as many premier names prominently featured on the checklist. Where the original set had both Mike Tyson and Muhammad Ali throughout the set, this time there's no Tyson and Ali is limited to case toppers and a couple of tough memorabilia cards. There's a lot of very limited cards but they're not directly noted as such. Serial numbering might not be necessary but it would have been nice to have print runs on the backs of the cards. Having to check rarity on a company website isn't the most convenient thing. 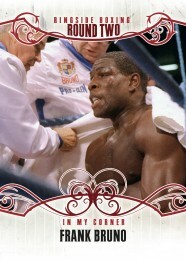 The Bottom Line: Boxing fans have long been under served in the sports card realm. So much so that after two releases, Ringside still feels like it's only touching the surface. These cards show a lot of care and have been produced with great quality. Just opening cards and uncovering boxers feels fresh as the market hasn't been saturated with them. I'd certainly welcome at least a couple more sets. The physical quality of the Ringside Round 2 cards is fantastic. They're excellent quality and don't overdo it on gimmicks. The various base set subsets feel busy, though. I like my base cards to be dominated by an image. Here, so many of the subsets carry large, busy fonts and peripherals that the result is a lot of clutter. I'd have preferred more images highlighting specific fights. I'd much rather have two guys battling it out together rather than a split-screen approach. 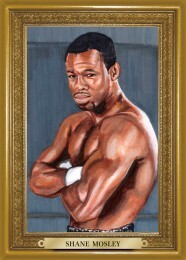 The Turkey Red cards carry an elegance about them, but the quality of the fighter paintings does vary. My favorite cards, appearance-wise are the memorabilia cards. They're generous with the swatches and the fighter is clear. 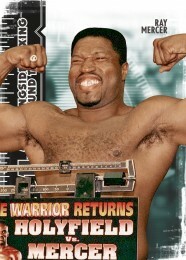 It seems as though the first Ringside Boxing set had more big-time fighters. 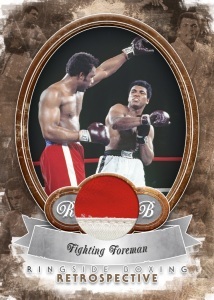 Ali is limited to case toppers and a couple of tough memorabilia cards. Tyson is likewise limited to relics. There are plenty of great fighters, but for a set as small as this, I'd prefer a few bigger names. Also, the subset repetition further limits the number of different subjects. Although single-pack boxes are in the $100 range, there's still some solid value. All of the hits are extremely limited. The autograph variations hide this somewhat, but there's still not a lot for any individual fighter. Memorabilia swatches are generous and maintain the high-end feel the rest of the set conveys. Rare parallels further add to value. As mentioned earlier, numbering would have added another level to this. Although only a handful of cards, the box felt like it had three distinct sections. The front had the base cards, which are largely a taster. Following that are the hits: one autograph and one memorabilia cards. Finally, it's the somewhat polarizing Turkey Red inserts. I think I did it to savor the moment as long as possible, but it also let me pay a little more initial attention to each of the set's components. This is a great set, although I don't know how much it'll be appreciated by non-boxing fans. The mainstream names are somewhat limited. But those that follow the sport are likely to fall in love with the upper second tier that dominates much of the rest of the set. Creative Cardboard Concepts is aiming for a knockout with 2011 Ringside Boxing Round 2, the high-end follow-up to their debut boxing card set released last year. Round 2 picks up where the first set left off, bringing back several subsets and inserts including the beautifully painted Turkey Red cards. Autographs, inserted one per pack, are all on-card. 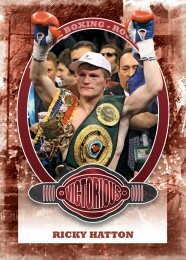 Each pack will also include one memorabilia card featuring fight-worn clothing or a piece of a ringside seat. All base, insert and autograph cards will have rare parallel versions. Several of the memorabilia sets will also have gold and silver versions. The bell rings for Ringside Boxing Round 2 in the first week of August. 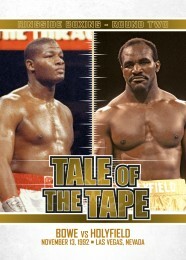 100-card base set includes the following subsets: Weigh In, Tale of the Tape, In My Corner and Victorious. Turkey Red (64 cards) inserts fall three per pack. Available in Gold (limited to 9) and Onyx (/1) parallels. One on-card Autograph per pack. Each autograph card is available in both silver and gold. 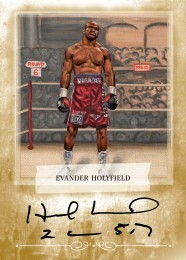 Cut Signature cards provide autographs from some of boxing's all-time greats. Basic memorabilia sets: Authentic Memorabilia, Double Memorabilia, Triple Memorabilia and Quad Memorabilia. 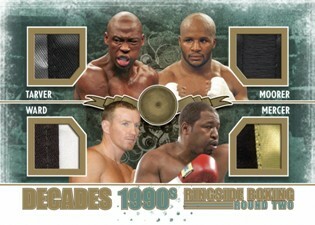 Decades Memorabilia cards pair up four featured fighters per card. 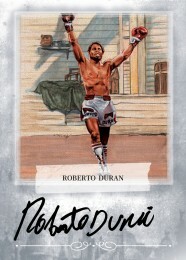 Battles Memorabilia cards highlight combatants from specific bouts. 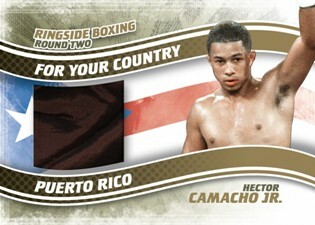 For Your Country Memorabilia celebrates the international boxing scene. 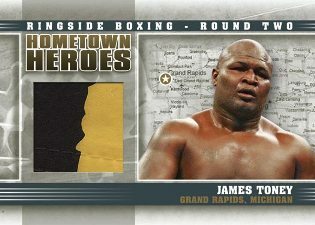 Hometown Heroes Memorabilia maps out the American hometowns of local boxers. 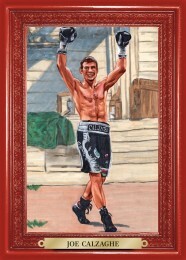 Moniker Memorabilia (/1) cards spell out fighters' names using name plates. 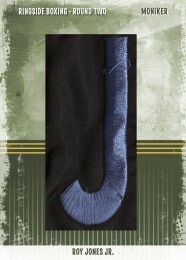 King-Sized Memorabilia (/1) offers jumbo memorabilia swatch pieces. Ringside Seat cards feature chair pieces signifying specific fights. 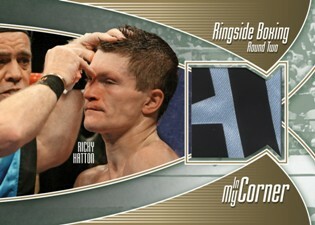 Additional memorabilia sets: Ringside Logo (/1), Patch Card, Waistland and In My Corner. Each eight-box case will include a numbered Muhammad Ali case topper limited to ten copies. There will be 40 different basic case toppers and 40 different memorabilia cards.